CFS Laboratory Services is a wholly owned part of Complete Filtration Solutions Limited with dedicated support capabilities. 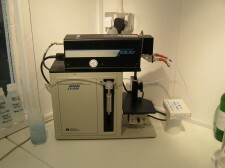 Its use is available to customers and non customers for critical testing of both liquid and filter samples. We are now also able to test air filters and air quality at your site. Filtration is a science and should always be treated as such. Forces like direct interception, inertial impaction, gravity and Brownian motion all affect the performance of a filter. Add in differing flow rates, viscosity and binding characteristics with chemical compatibilities and only the most experienced can offer the best advice. One filter is not good for all applications. The laboratory at CFS houses equipment essential to offer a customer the best advice, but you would not believe how rare this equipment is within filter manufacturers. We can take 200ml of a liquid and give a full report on its particle loading from 125 micron to 0.5 micron with extrapolated data down to 0.1 micron. This means we can test and give results based on fact in the realms of cryptosporidium parvum, yeast and the similar organisms. We can provide assurance that what you are buying is right for you. The world leader in laser particle testers produces (Particle measuring systems) a range of machines and CFS has invested in several laser heads for its customers as well as the pharmaceutical grade tester. It is believed CFS has testing capabilities no other UK manufacturer currently matches. It's amazing how many filter manufacturers make filters with no test equipment themselves. They may rely on the claims filter media manufactures make (flat sheet used to make filters) but this could be a poor strategy. How do the media companies test their medias, at what flow rates, with what contaminants? Change one or more of these and the filters performance changes. Many media suppliers only quote "air diffusion rates" which may not have any relevance to liquid filtration unless correlation is done. The standard OSU-F2 (modified) test, developed by the Oklahoma State University establishes the removal efficiency of a filter at 10 liter/min flow per 10 inch filter and the best filter companies give a removal efficiency of beta 5000 (99.98% removal) from installation. Move from 10 litre/minute and that same efficiency cannot be maintained whatever some may say. Only experience can guide you on this and here we aim to help. If you look at most literature it will show a graph showing varying flow rates and the resistance to flow at each flow, what it does not point out is that above 10 l/min the removal efficiency may not be as expected, as stated on the filter. This is down to pure physics not the maker of the filter. CFS can guide and help again here and show by practical test what the truth is. How, we ask, can anyone make a filter without the ability to say how it works? But many do, and without retribution. Many come into the UK from overseas and are sold as UK produced, often far from the truth. CFS shows exactly where our products are made, and hide nothing. We at CFS do not rely on luck or chance when dealing with our customer's good name and future. We have invested in the latest and best available equipment to support our UK and Irish clientèle. Filtration is a science and only by analyzing the elements with which we work can we gain the best options in filtration. Water is, believe it or not, the most difficult liquid to filter as no water from any two sources is the same, therefore the filtration required can vary tremendously. Why have a 40 micron pre filter if the largest particles are no larger than 5 micron. Only by critical laboratory support can the correct filtration be recommended. This filtration support has a tremendous cost attached to it, and most filtration distributors, and even some manufacturers, cannot afford the state of the art equipment and personnel required to support this service. CFS Technical and Laboratory Support believes that without this support, filters cannot be manufactured and rated correctly and the correct recommendation cannot be made to give the customer the optimum savings and assurance of final quality. Only by testing the liquid after a filter, can you be assured of the filtration you are getting. You may have a filter which is, say, 2 micron but is the liquid after it completely free of particles larger than 2 micron? We can show you the truth and you may be surprised what we find! Laser Particle Testing of liquid samples to establish the size of the particles in a sample and the number of particles in each micron group. Only by doing this test can the correct recommendation of filtration be provided. The equipment to undertake these tests has a cost of several tens of thousands of pounds and is essential to make, and test, high quality filters for the correct options to be recommended to customers. We can test your existing filters and show you what your filters are really doing. We can also test your raw water or liquid and recommend what filters you really need to achieve your desires and requirements. Everything is based on scientific test and assessment. At CFS we can help without using guesswork and I am sure you will agree this is the best option. Our equipment tests to sub micronic levels and is “state of the art”. We can provide results on tests in ppm and MS on any sample provided. Certain filters perform best at certain PH levels and only by testing and measurement can the correct option be offered. Samples observed under the microscope can be recorded and provided as part of a comprehensive report. The capabilities at CFS are covered by again the latest technology and includes Trinocular high powered microscopes with full photographic capabilities and maginification to 1600x. We can tell you have particles or bacteria and even show you them if required. For both membrane filters and pleated depth type filters. Remember a leaking filter is not a filter at all! We can test membrane filters using the latest computer controlled equipment testing for diffusional flow and pressure decay to fractions of a millibar / minute. If you are a producer of food or beverage products and need filters for Cryptosporidium protection, you may believe you have a 1 micron absolute filter of a suitable standard. You may in fact have a filter from a major filter producer which has never been tested. Can your company afford the risk? We can test and show what the truth is! You need not take any risk with CFS Limited. If you need to protect against E. Coli we can provide the right solution. If you want to bottle wine without a risk of spoilage organisms, again we can help. If you are an electronics company and produce wafers and electronic devices, your reject rate is governed by the quality of filtration. CFS can minimise your reject rate by testing and evaluation, eliminating the guesswork many use. Our tests meet all USP and CFR 21 standards for Pharmaceutical tests meaning you can have the confidence that the equipment used to test is “state of the art” and of the highest and latest standard. The recognised test to check a filter's efficiency is via the modified OSU-F2 test to establish the absolute removal efficiency of a filter. However, many have not invested in the equipment required to do these tests, and even some well known filter manufacturers do not have their own test equipment to test the filters they produce and sell. Even major manufactures do not offer world wide technical support, but by working with CFS Limited you can be assured that through scientific test and evaluation you get the right recommendation on filtration. We can also provide, if desired, filters of the highest standard and test criteria. This support is not the norm and is, in fact, vary rare in the UK. We at CFS regard it as essential to give you, the customer, the service and products you need and require. If purity is the desire, we can provide it! Pure Test, Pure Evaluation, Pure Science and Pure Filtration! CFS can offer a unique contract cleaning service for metal filters of almost all types, providing an economic alternative to component replacement. Whatever the contamination or application, it is likely we can cater for your requirement. Each cleaned component is tested for cleanliness and integrity. This service is ideal for Hospital, the NHS and Pharmaceutical manufacturers etc. If a filter is beyond cleaning and mechanically flawed, CFS can offer a replacement unit at a competitive cost, but we would expect each filter to withstand many cleanings. One of the most important aspects of air filtration is knowing what is in your "air stream" before a filter and what is in it afterwords. Only by testing can real assurance be gained. If you live near a diesel rail station your air quality will be much different to that in the open country and we can test and advise what you have and may need. CFS has purchased the latest laser particle testing equipment available and can measure to 0.3 micron as designated for HEPA filtration. Again, why leave anything to chance, most filtration companies offer no technical support capabilities or internal test. CFS takes filtration seriously and leaves nothing to chance. We can test filters at your site if required and provide an analysis of the air quality outside your premises or on the outlet of your HEPA or other filter.